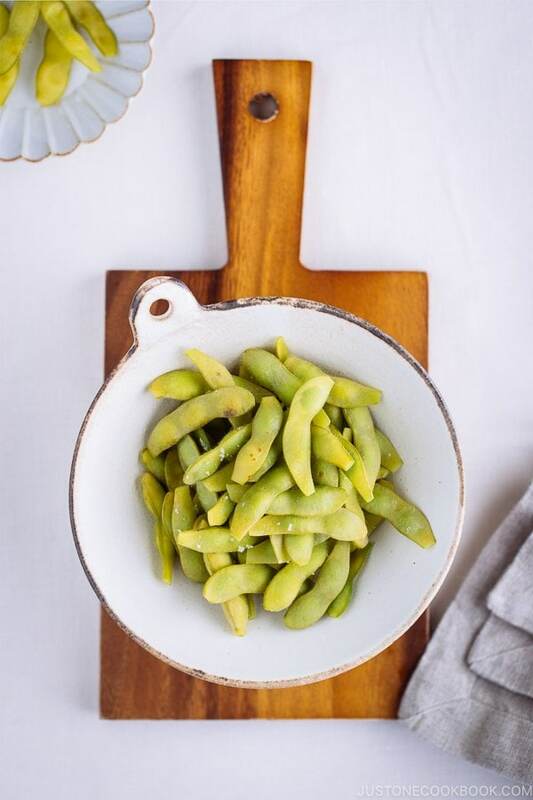 Lightly boiled and perfectly salted, edamame is the classic Japanese snack that is not only delicious to snack on but also packed with a nutritional punch. 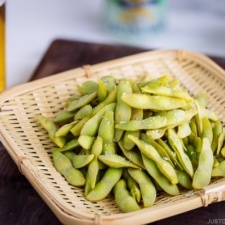 Learn how to cook these young soybeans with the authentic Japanese method. Edamame (枝豆), pronounced eh-DAH-ma-meh in Japanese (ay-duh-MAH-may in English), is most popularly known as the little snack that is brought to you when you sit down to a table at a Japanese restaurant. 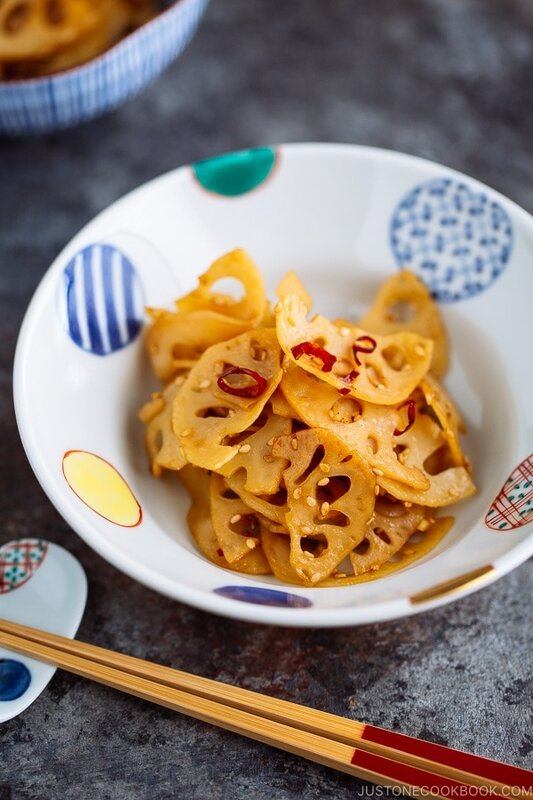 With a sweet buttery taste, these lightly boiled or steamed soybeans are not only delicious, but they’re also fun to munch on while waiting for the rice bowl or ramen or sushi platter to be served. 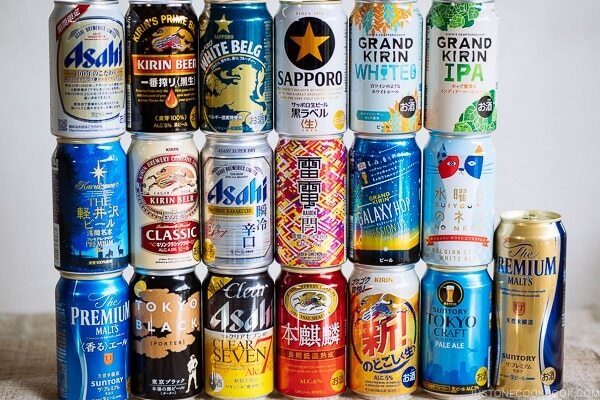 If you’re in Japan, you’re most likely enjoy these fun snacks with some foamy cold beer. Edamame are edible young soybeans that are harvested and picked before they have ripened. In Japanese, eda 枝 means ‘stems’ and mame 豆 means ‘beans’, as they are often sold while still encased in pods with the stems attached. Long been consumed in Japan since the ancient times, edamame is now considered a mainstream ingredient in the US in the recent years. They are just as common as peas where you can find them being sold in plastic bags in the freezer aisle at most of the grocery stores in the US. They are also available shelled, fresh or frozen. They are in season between June to September, so this is a good time to hunt for fresh edamame at your local Japanese grocery stores. 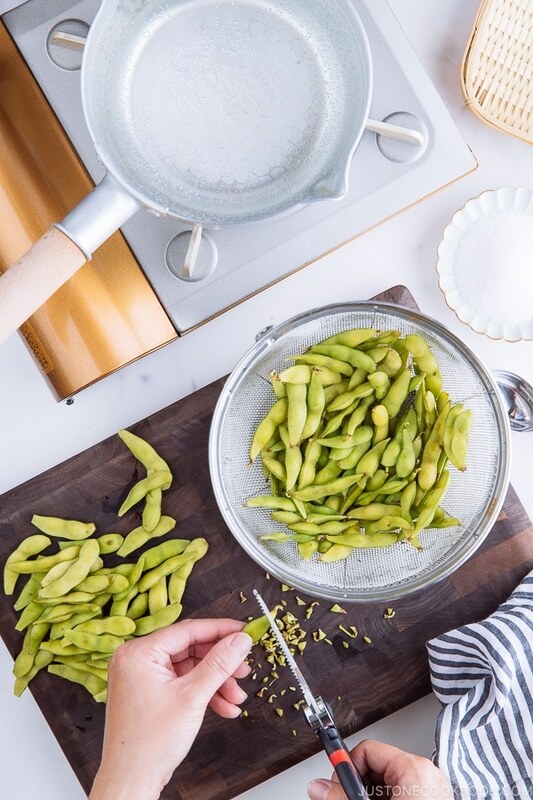 To cook edamame with the classic Japanese method, look for fresh pods with stems attached and they should look bright, plump and slightly fuzzy. Low in calorie and high in fiber, edamame have always been considered as a healthy food in Japan that delivers many nutritional values. Just 1/2 cup of these soybeans a day punches up the vitamin and mineral content of the diet needed by our bodies. 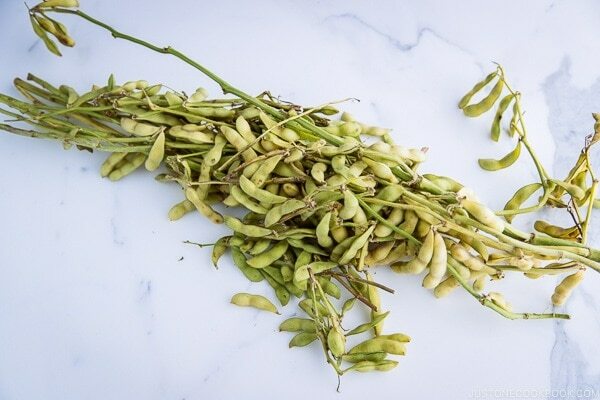 With a complete source of plant protein, edamame provides all of the essential amino acids needed for the bodies, which may help reduce insulin resistance and prevent hypertension. A great protein choice for those who follow a vegetarian or plant-based diet. The calcium in the soybeans may help to increase bone mineral density, regulate blood sugar and lessen symptoms of premenstrual syndrome (PMS) among women. 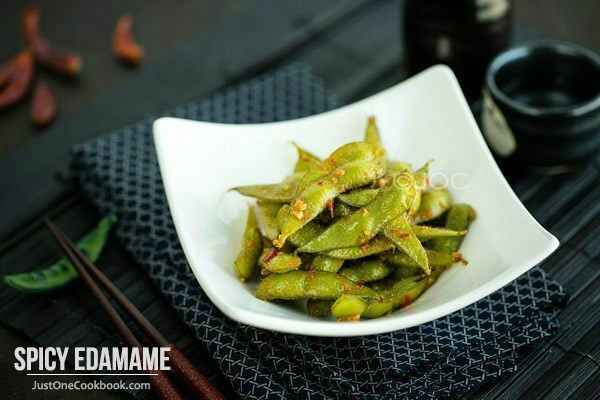 Edamame is also rich in several vitamins and minerals, especially vitamin K and folate. Adequate folate intake is particularly important for pregnant women and young children as it is responsible for red blood cells and brain health. For a plant food, edamame provides an excellent source of iron. Sufficient iron is essential to transport oxygen throughout the body, ensuring the energy level of our bodies. It is also necessary to maintain the health of our skin, hair, and nails. I still remember spending my summer evenings at my grandma’s house where I was assigned the task of trimming edamame pods. Do you know why we cut off both ends of the pods? We do that so the salt water will season the soybeans inside the pods when boiling. What a neat trick, isn’t it? Sprinkle salt and rub the edamame pods against each other. This helps to remove some of the fuzzy hairs on the pods. It also helps to retain the bright green of the pods and absorbent of flavors while cooking. 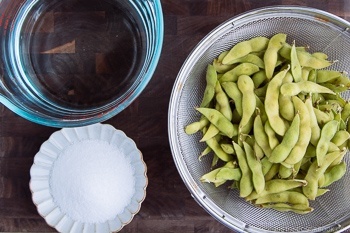 A rule of thumb is to blanch edamame in 4% salt water (so don’t mess up the classic method). It’s easy to remember 40 grams of kosher salt for 1000 ml water. 40 grams of salt is used for rubbing the edamame before boiling and for the boiling water. 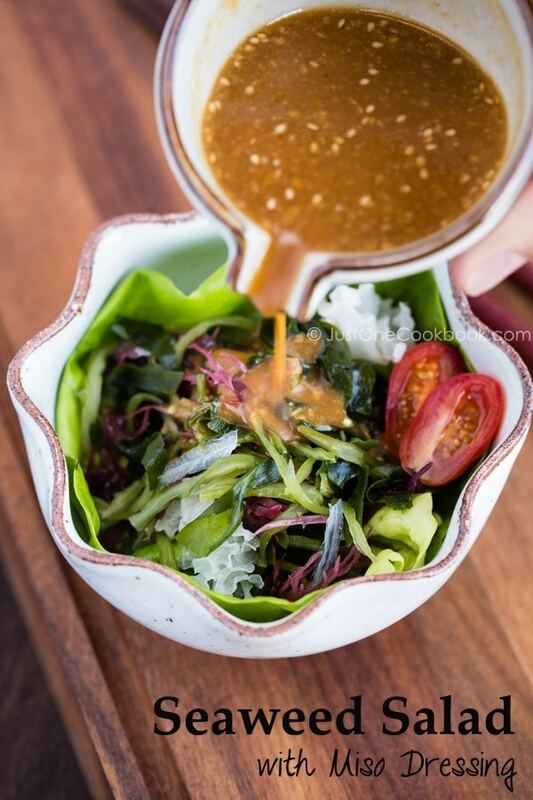 Once you finished cooking, do not rinse under water. 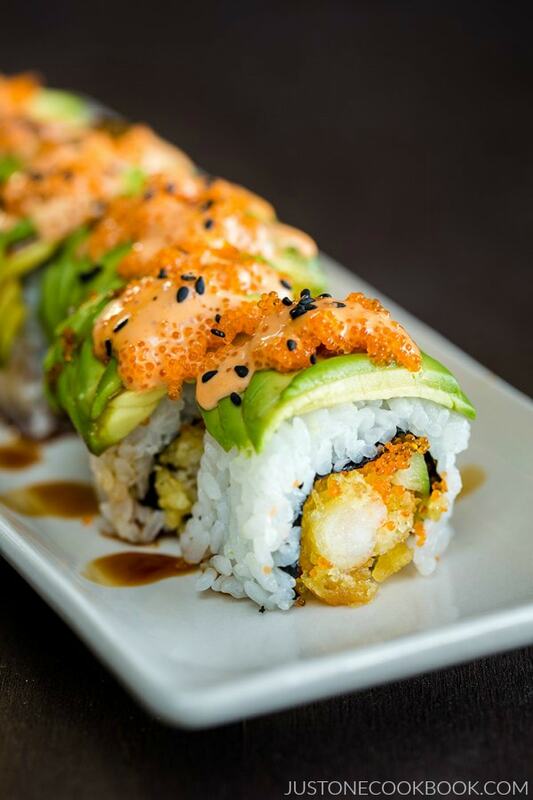 We let the edamame absorb more flavors from the pod naturally. It is not required to sprinkle salt after cooking in salt water. However, you can sprinkle a tiny bit of salt if you like. 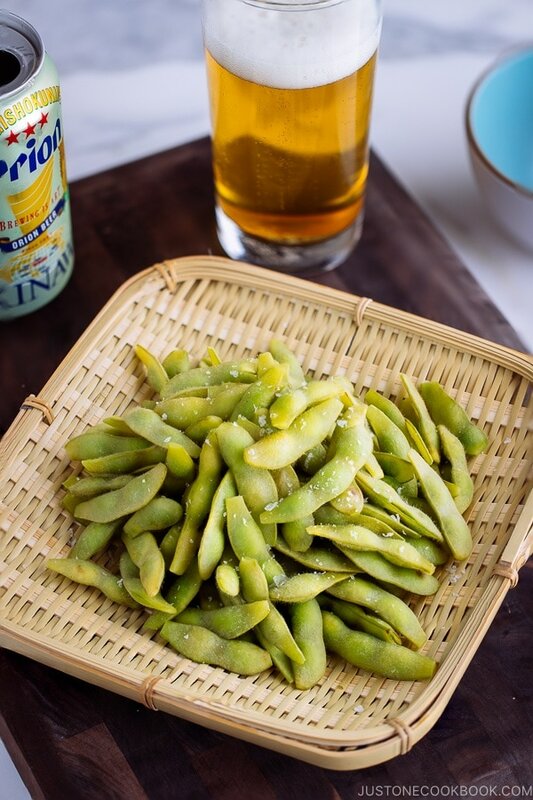 Need a Beer to Go with Edamame? Remove pods from the stems. Measure the weight of edamame pods (if you do this once, you know the rough amount next time without measuring). Start boiling water in a pot. Using a pair of kitchen shears, cut off both ends of edamame pods. If the water starts boiling, cover and turn off the heat for now. 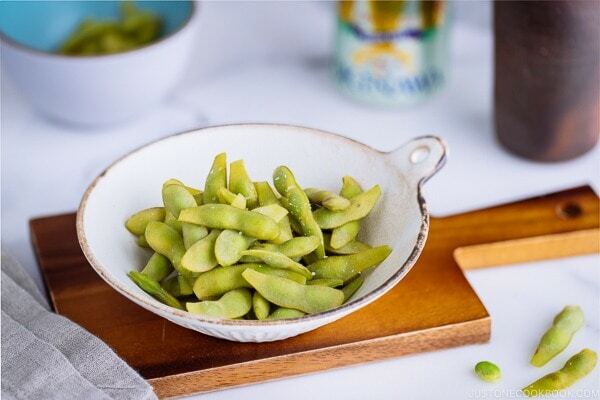 Place the edamame in a bowl or tray and sprinkle 1 Tbsp of (40 g) kosher salt. Rub the pods against each other with hands. Add the rest of the kosher salt into the boiling water. Then add the edamame pods WITHOUT removing the salt. Cook on medium heat for 3-5 minutes depending on the size of the pods. It’s easy to remember 4 minutes, but start checking the doneness after passing 3.5 minutes. Remember we do not run cold water on edamame after boiling so I recommend under-cooking slightly. Stir occasionally to make sure all the pods are cooking evenly. If you see the foam forming on the water, remove it with a fine mesh skimmer because we do not wash the pods after cooking. Drain water in the sink or scoop up the edamame pods to a sieve. Let cool naturally so the edamame can absorb the flavor (If you skip cutting the ends of pods, please leave it for at least 1 hour). If you like, sprinkle a little bit of salt (I used sea salt flakes). Enjoy! If you want to preserve the edamame, cook the edamame and then freeze. You can defrost naturally but you can also quickly blanch in boiling water or use microwave to reheat. Hi Nami, Darryl from Australia here. I come to LA quite often with my wife to visit her sister in law. 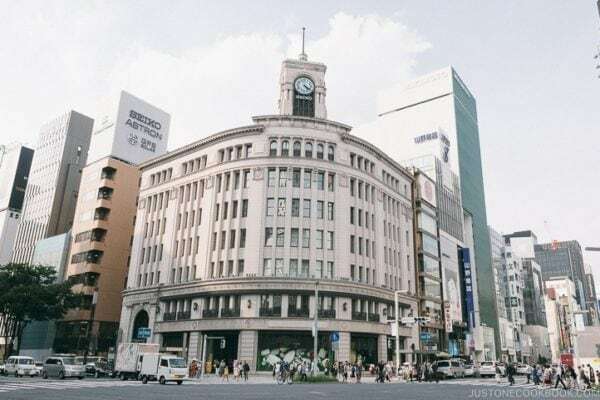 Last time we came, we went to her favourite Japanese restaurant and had edemami as you have suggested with the exception it was sprinkled with grated French truffles. It was absolutely heavenly. Hi Darryl, Nobu in Perth also has edamame with truffles and yes i agree “heavenly”. Yum I love edamame, I tried my very first ones at Nobu in Perth and we now have them at home for snacks. I enjoy edamame very much. Love the tip of cutting the ends off. Makes so much sense. Should I be doing the same thing for frozen edamame? Hi Liz! Probably the best method is to follow the instruction provided in the package. 1) boil the edamame in salted water according to the instruction (but remember it’s already cooked, so you don’t need to “cook” it again – don’t trust the instructions as some package says very long cooking time or 2) naturally defrost. 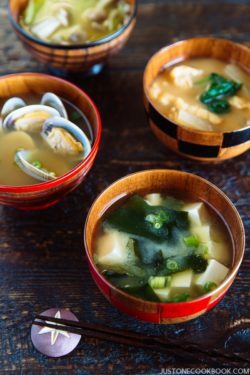 Hi Nami, do you eat the pods as well like snow peas? I have and they were a bit stringy but tasted ok. I have never seen anyone else do this and wondered if it was ok.